Milton of Campsie Billington's cafe in Milton of Campsie Scone Spy. A natter, a bit of fresh news, a few surprising developments and the warm feeling that comes with renewing that old acquaintance. The same thing applies in the Scone Spy world. 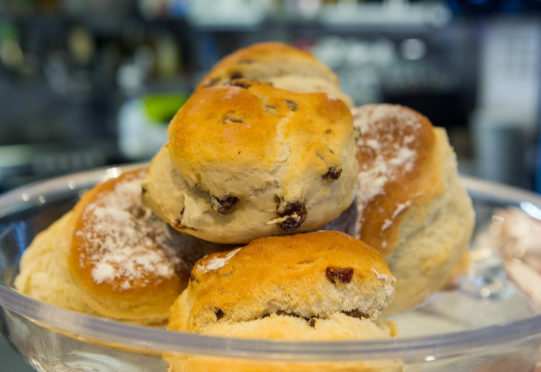 Over the years there have been a lot of cracking cafes, tempting tray bakes, delicious dishes and, of course, scrumptious scones. One of those beauties was Billingtons in Lenzie, straight across from the town’s old parish church. It used to be a branch of Peckhams and the new owners turned it into a delightful deli-plus. The scone, naturally, didn’t disappoint but one of the things that really stuck in the mind was the ice cream, sourced from a nearby dairy farm. The whole experience was a top-notch treat, so when I heard another Billingtons branch had opened I knew it just had to be worth a visit. This one is in Milton of Campsie, still in East Dunbartonshire but a few miles away in the shadow of the hills. It’s on a junction, tastefully painted in the familiar green and gold and just as enticing. Inside, it’s bright and airy with modern wood panelling and stripy, light green couches and lovely, sink-in leather armchairs. On a chilly day the welcome was warm – especially as one of the staff checked if we needed a little warming up and switched on a heater directly under our couch. Ah, toasty heaven. When we arrived, we were too late for the breakfast menu, but the bacon, sausage or scrambled egg baps – add a potato scone for 50p – sounded like they’d be worth setting an alarm for. And we were a little too early for the afternoon tea. But what a bargain that looked at £16 for two. Elsewhere, there were a selection of small plates, such as hummus and warm pitta bread or bruschetta with cream cheese and smoked salmon. Burgers – regular, with cheese and bacon or veggie – were another option, as were paninis with just about every filling imaginable. Or some nice-sounding salads that also covered all bases, and a hearty bowl of soup. But my dining companion and I settled on a baked potato and an omelette. The spud came laden with tuna and cheese and was well worth the short wait. The ham omelette was equally tasty and came with salad and crisps. Both were nicely presented on wooden platters. As usual, there was room for the scone which was well-fired on top, packed with plenty of fruit and was a spongey affair. In fact, filling though it all was, the chocolate brownie – one of a nice selection of tray bakes – proved irresistible, too. We were in no hurry and with some nice music playing in the background, it was indeed good to relax with an old friend.